Kaikai Kiki Gallery is pleased to announce that from Friday July 25, we will hold a solo exhibition by artist Lee Ufan. Since the late 60s, Lee Ufan has been praised both in and outside of Japan as one of the leading artists of the Monoha movement. In recent years, however, he has moved beyond this framework to become a one of a kind artist occupying his own singular territory. 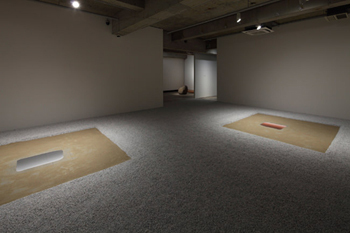 In 2010, a museum of his work, Lee Ufan Museum, opened on Naoshima Island in Kagawa prefecture, while in 2011, a solo exhibition of his work was held at the Guggenheim Museum in New York. His work is also currently on view in a special exhibition at the Palace of Versailles. At present, he divides his time between Paris and Kamakura, devoting his days to his work. This new exhibition will feature two installation works. In keeping with the Monoha theory of exploring the work’s relationship with its environs, the installations are composed of stones, sand, canvas and other materials which are for the most part untouched by the artist’s hands. 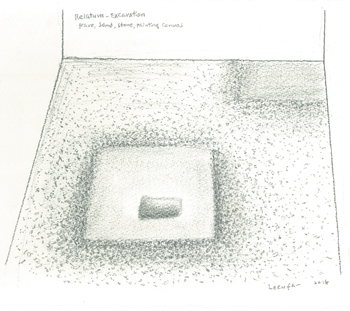 In doing so, Ufan creates a synergy with the audience and their surroundings, allowing him to transform the results into a space with archaeological elements. In contemporary art terms, there are few acts more poetic or ambitious in their challenge to the thread of art history. We hope you will experience this space, where past, present and future become one and the artist’s fantastic imagination is allowed to bloom, for yourself. Holding an exhibition with Lee Ufan, both for Kaikai Kiki as a gallery, and for myself, is an act of great meaning and the product of six years of communication with the artist, as well as collaboration with Shiraishi Contemporary Art Inc./ SCAI THE BATHHOUSE. Monoha remains a singular movement within not only Japanese history but global art history. Its challenge to the hegemony of western art was built upon a firm understanding of western context and offered a simultaneous inhalation of and escape from that context, leaving a trail within the art world that was the cause of much debate. At the same time, the fact remains that its deconstruction of western context is difficult to fully understand and was lacking in organization. For this reason, the reaction within the art world was also quite varied in its level of appreciation. However in February 2012, the exhibition Requiem for the Sun: The art of Mono-ha was curated by Mika Yoshitake at Blum & Poe Gallery and the movement’s more challenging elements were rewoven into a tapestry that now sits at the center of the art scene. The man responsible for carving the intellectual core of that movement was Lee Ufan and I have long dreamed that in exhibiting his work, I would be able to showcase the meaning of the east within contemporary art. I am now happy to present the realization of that dream.